By Stephanie Dickison Rajan (Raj) Khatri was born in Indian but grew up in Nepal learning to cook a variety of cuisines, inspired by his mother, Binda. "Japanese, Thai, Chinese, anything and everything," he says. That wide base of knowledge led Khatri into the hotel industry where he worked at Le Royal Meridien Phuket Yacht Club as the Indian chef in 2006. According to Khatri, he was the first person to introduce Indian food to the hotel. It is here that he met his beautiful wife Joy in 2006 – she was working in the front office while he was cooking up a storm in the kitchen. They spent almost two years there, with Rajan cooking for 400 guests or more a night. Then came the Sheraton Hua Hin Beach Resort with 250 rooms, where he became the acting supervisor chef de partie for two years, and then the Hilton in Bangkok, where he was sous chef. After working his way up the ranks in hotels, Rajan opened his first restaurant, Real Tandoor in Bangkok. The couple made their way to Toronto in 2011, and Rajan became chef at a cozy little Indian restaurant on Kingston Road called Vindaloo. After a few years, the owner wanted to move and proposed that Rajan buy the place. Rajan said yes. That was over a year ago. His first Indian restaurant in Canada might appear the same from the original Vindaloo. After all, the dining room is similar as are the types of dishes, but Rajan changed the quality of food, ensuring only fresh products - never frozen -are used, and the high quality is maintained throughout the menu. He emphasizes his "hygienic clean food," and "spotless kitchen." After all those years working in high-end hotels, messiness and uncleanliness will not be tolerated. Joy works in the front of house while Raj is in the kitchen. Their two young boys (Roger 8, Rafael 7) can sometimes be seen doing homework quietly at a booth at the back of the restaurant. The family-run restaurant seats 32 and offers take out, delivery and catering. The menu features starters, chicken, lamb, goat, seafood and vegetarian options. 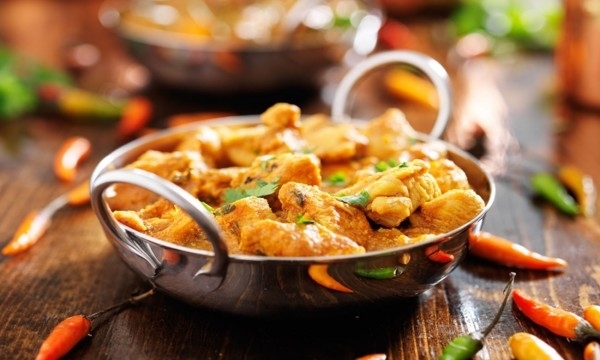 Select dishes done in the tandoor oven or a thick curry (every curry is served with rice), freshly baked breads including naan, roti and Lacha Paratha, and desserts, are all made in house. For drinks choose from Mango/Salted Lassi ($3) and Masala Chai ($3), wines, liquors, beers and even martinis. The dishes are priced so affordably that you can dine out a couple of times a month: $1.25 for papadums (your first order is complimentary upon arrival) to the most expensive $20.99 for Mixed Grill Platter of chicken tikka, malai kebab, fish tikka, lamb kebab and shrimp, serve with naan). Vindaloo is open six days a week, closed Mondays. Check out our Facebook page for more photos.